Preheat the oven to 180°C, gas mark 4. 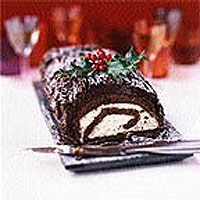 To make the roulade, grease a 33cm x 23cm Swiss roll tin and line with baking parchment. Place the fruit and nut chocolate in a bowl over a pan of very gently simmering water. Leave for about 5 minutes, stirring occasionally, until melted. Meanwhile, using an electric whisk, whisk together the egg yolks and muscovado sugar for about 2-3 minutes, or until thickened and very pale. Then stir in the melted chocolate until just combined. Whisk the egg whites in a thoroughly clean bowl until the mixture forms stiff peaks. Using a large metal spoon, fold a quarter of the egg whites into the chocolate mixture to lighten it. Gently fold this mixture back into the remaining egg whites. Pour the mixture into the prepared tin and level the surface, smoothing the mixture gently into the corners. Bake for 15-20 minutes, or until risen and just firm to the touch. When the roulade has baked, sprinkle a sheet of baking parchment with a fine dusting of icing sugar. Turn the cooked roulade out onto the paper, then remove the tin and leave the lining paper on the roulade. Leave to rest for at least 3 hours or overnight. To make the filling, whisk the brandy cream to soft peaks. Remove the lining paper from the roulade and spread the whipped cream to within 1cm of the edges of the roulade. Starting from a short end, carefully roll up the roulade, lifting the paper with one hand and easing the sponge into a roll with the other. Slide onto a flat serving plate and chill while you prepare the curls and truffle cream. To make the chocolate curls, heat the chocolate in a bowl over very gently simmering water until melted, stirring occasionally, until smooth. Pour slowly onto a large marble, wood or plastic board and leave to cool and set. To make the truffle cream, spoon the brandy cream into a heavy-based pan and heat gently until hot but not boiling. Remove from the heat and stir in the chocolate. Leave for 2-3 minutes, until the chocolate has melted, stirring frequently. Turn into a bowl and leave until the mixture is thick enough to hold its shape when stirred. This will take 30 minutes-1 hour, depending on the temperature of the ingredients and the room. To decorate the cake, spread the truffle cream over the roulade with a palette knife. Once the chocolate for the curls is set, draw a sharp knife, held so that it is almost flat, across the chocolate to pare off the curls (see 'Cook's tips'). Scoop up the curls with a fork (they may melt if you use your hands) and press gently over the truffle cream to give a bark-like effect. Cover carefully and chill until needed. To serve, dust with icing sugar and, if you like, decorate with holly leaves. Safety note: holly and berries are poisonous to eat; if you use them as a decoration, wrap the stalk in foil before placing it on the yule log. If the chocolate breaks off in brittle splinters when making the chocolate curls, leave it to soften slightly in a warm place. If it's too soft, place it in the fridge for a few minutes. To encourage the truffle cream to thicken, beat the mixture lightly with a balloon whisk. The roulade can be kept for up to 2 days, covered, in the fridge, or frozen. Freeze before making the chocolate curls and add after defrosting overnight in the fridge.